Movie Review: American-Iranian filmmaker, Ramin Bahrami, returns in big with “99 Homes”, a thoroughly observed analysis of the financial/real estate crisis that ravaged the US around 2010. Andrew Garfield and Michael Shannon star, respectively as the man to evict from the house his family was living forever, and the greedy real estate broker with an insatiable ambition to own more and more properties in the state of Florida. Dennis Nash (Garfield), an honest construction worker who lives with his mother (Laura Dern) and little son (Noah Lomax), gets desperate after going into court and be told by the judge that he has to vacate his house. Dennis gets panicky with the situation, but relies on more 30 days given by the judge, in the case he wants to appeal. Next morning, for his surprise, two inflexible cops and the impeccably dressed real estate broker, Richard Carver (Shannon), who works with a gun strapped to his ankle, appear at his door, informing that the house is now owned by the bank and that they have two minutes to pack what they want and leave. It’s an embarrassing moment for Dennis and his family, who are placed in a motel that hosts a bunch of people in the same situation. In extreme need of money and with the unique thought of retrieving his family house, Dennis accepts a dirty offer made by Carver and goes to work for him. He’s hired to fix houses that need urgent repair, but soon starts doing to other people exactly the same as Carver did to him. ‘Don’t get emotional over real estate’ – says the glacial Carver. Bluntly and heartlessly, Dennis shamefully evicts people under pressure from their houses. He isn’t an insatiable vulture as Carver, though. His conscience bites at every dispossession, becoming unbearable when his mother leaves with his son, abandoning him in a huge new property with a spectacular pool. I was happy to find that Mr. Bahrani, who co-wrote with Amir Naderi, is back to his best, recovering his resonant voice when it comes to denouncing the world’s social problems. His previous, “At Any Price”, wasn’t so consistent, but his past work includes the brilliant “Man Push Cart”, “Chop Chop”, and “Goodbye Solo”. 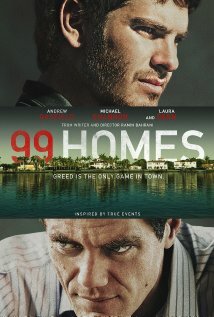 “99 Homes” confirms his superior narrative skills, while showcases two smashingly compelling performances by the protagonists.